I started reading comics intermittently as a kid in the 70s and early 80s, in a fashion probably familiar to a lot of my peers. Occasional "dad brought some home after stopping at the newsstand for Mad Magazine" or "got at the hotel gift shop to keep me quiet on the drive home from vacation" buys, whatever usually-coverless stuff was in the rack at the doctor's or dentist's office, etc. I endured a lot of cliffhangers, picked up the endings of many stories to which I didn't have the beginnings (the "Crisis on Earth-Prime" finale was one of those hotel gift shop buys), and so forth...it definitely makes one a believer in the "every issue is someone's first" when every issue was often your only exposure to the characters and storyline. But I'm not here to complain about how modern comics writers too often ignore that dictum and write only for the dedicated collector. No, there's another aspect of my childhood experience that was fairly odd, and that it took me a long time to appreciate. characters and still advanced the plot. You see, the 70s and early 80s could be described as the Roy Thomas Age of Comics. 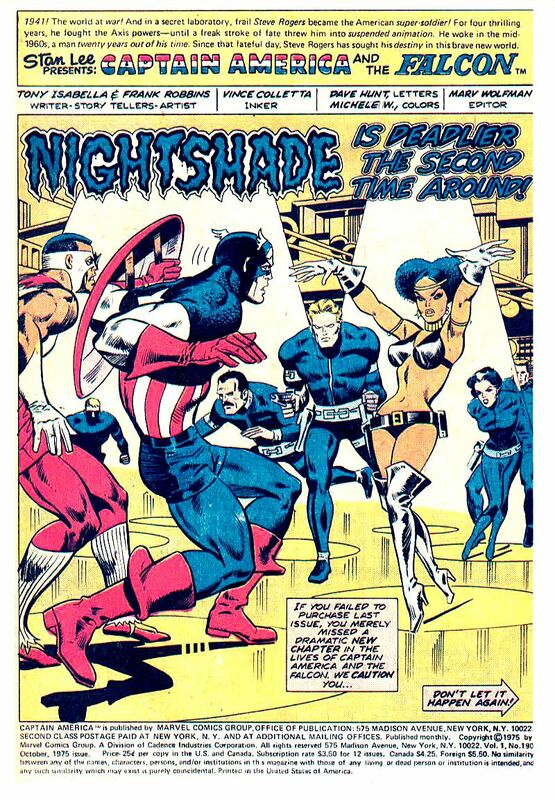 I got a solitary issue of Invaders #6 in grade school, read scattered issues of Captain America and the Falcon that brought back a number of 40s characters during the later 70s, and picked up the occasional All-Star Squadron comics during the early 80s. (I missed out on reading the Nomad issues as a kid, because the cousin from whom I'd been borrowing Cap comics had lent them to another friend, whose mother threw them out.) Once I did start reading comics more regularly (Alpha Flight #12-13 being the first time I made a point of picking up The Next Issue), there were still some Roy Thomas comics (or those in his style) around, like America vs. the Justice Society. While my knowledge was more gap than not, the use of footnotes assured me that even if I hadn't read the older stories being referred to, those stories were out there and could in principle be found and read. Roy Thomas had a knack for telling stories about old characters as if they were new characters, roping in the target demographic (i.e. me at the time) without depending on any knowledge about the old characters. He was taking his nostalgia for these older characters of his own childhood and passing it on to the next direction without it being just "Hey, remember these old characters we all loved?" It was the sort of thing you had to do if you wanted a book to survive. (The 1970s All-Star Stories that Thomas suggested to DC did not...he was exclusive to Marvel at the time and could only cajole Gerry Conway into getting the book made. If Thomas had written it, would it have lasted? Probably not, because the DC Implosion happened around then, but it might have stood more of a chance.) Even a book that wallowed in continuity as much as America vs. the Justice League did was quite readable to teenaged me. Careful, Cap, she's a minor. On the other hand, while I did like the stories about all these WWII-era characters whose stars had faded before my own father was old enough to read comics, I frequently found the art not to my liking. It was a long time before I appreciated Jack Kirby, for instance, and I was reading brand new comics drawn by him rather than reprints. To pile on top of that, regardless of the artist portraying them in the new stories, I found a lot of the Golden Age character designs to be...bad. Put those designs in the hands of artists who tried to evoke the nostalgic feeling that Thomas those like him were writing to? Ugh. Frank Robbins is perhaps the standout there, he was all over Marvel comics of the mid to late 70s, and going from a Cap comic drawn by Sal Buscema ("the crazy Buscema") to one drawn by Robbins was pretty jarring to gradeschool-aged me. It would be a long time before I found out he was an actual Golden Age artist and not just some new guy Marvel hired because he worked cheap and fast, I just knew I didn't care for his style back when I was in grade school (and high school, and college). About thirty years later on, I got the collected editions of a lot of comics that I'd only read bits and pieces of as a kid, like the Secret Empire/Nomad arcs in Captain America, or Power Man and Iron Fist before they became Power Man/Iron Fist (PM/IF was one of my first back-issue-bin titles, along with Uncanny X-Men and my attempts to backfill my New Mutants and Alpha Flight collections). I'd long since come to appreciate Kirby, but in reading a bunch of 1970s comics with an adult eye, I found I quite liked what Frank Robbins brought to the table. Some of this is what Scott McCloud would describe as learning to see past the surface and to the deeper structure, but I think it's more than that. Because the surface was important here too. Robbins started drawing comics in the 1940s, and while his style did evolve, it retained a strong surface element consistent with the Golden Age (whereas Kirby's work changed more drastically in its surface features). Comparing Johnny Hazard to Robbins's Captain America shows a lot of differences, but telling similarities. This made him an excellent choice to work with Roy Thomas, because he wasn't some new guy faking the nostalgic look as I had once thought, he was an actual part of that past that Thomas idolized. But what had let me appreciate Robbins's art not despite the surface features, but because of them? I think it's because I was finally old enough to have my own nostalgia. Golden Age comics were not part of my childhood directly, only by proxy through Roy Thomas and Gerry Conway and others. Because the writers of the 70s and 80s were careful to aim at what they thought Kids Today wanted in terms of story structure and pacing and so forth, they got around the "not my nostalgia" issue, but artists like Robbins were still mostly doing their own old-timey thing. Thomas could get me to like the characters, but that didn't extend as much to the artwork, not back then. referenced from a Robbins panel. Nostalgia is not really something you can grasp until you've lived long enough to have a past that has gone away, something that you miss and want to bring back. The old "How can I miss you if you won't go away?" problem. The Golden Age of comics is still not my childhood. But enough of my childhood has become grist for the nostalgia mill that I can understand how it feels now. I may not have Roy Thomas's own enthusiasm for the JSA, but I have my own versions of the JSA to remember fondly, and I can understand more fully where he was coming from in the 70s and 80s. And I can look at art by people like Frank Robbins and appreciate it as being well-done in a style that simply came and went before I was born, much as I can appreciate Classical music or a 1930s movie musical. Dvandom, aka Dave Van Domelen, is an Assistant Professor of Physical Science at Amarillo College, maintainer of one of the two longest-running Transformers fansites in existence (neither he nor Ben Yee is entirely sure who was first), long time online reviewer of comics, knows that neither Thomas nor Robbins is a plural word so the possessive takes 's rather than just ', is an occasional science advisor in fiction, and part of the development team for the upcoming City of Titans MMO.